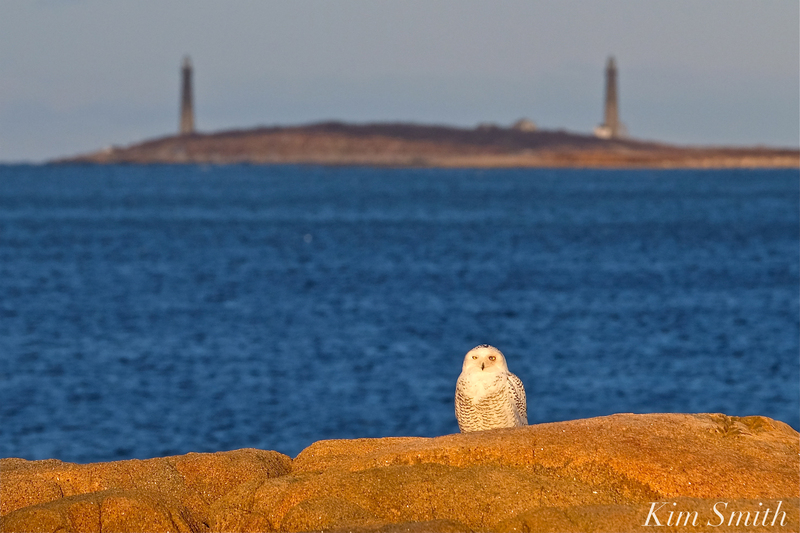 Hedwig arrived at Bass Rocks with the rising sun. Her face was smudged with blood from what I imagine was a satisfying breakfast. Off and on throughout the day, in between naps, she preened and groomed. By the end of afternoon her facial feathers were smooth and white. After a day of grooming and resting, notice how much cleaner her face is by late afternoon. 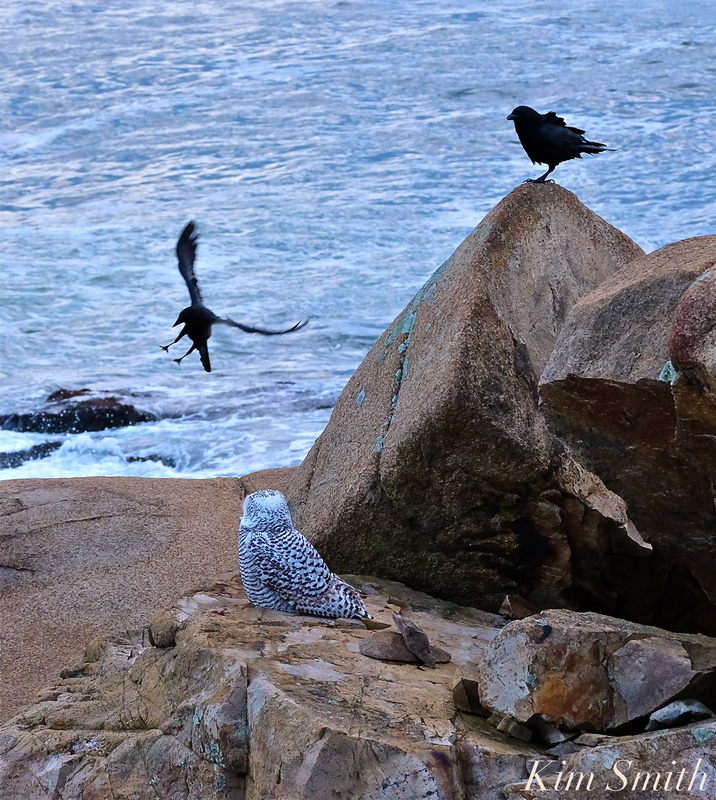 A horde of crows arrived to harass Hedwig but she held her ground. Hedwig crouching down while the crows were dive bombing. She jumped from the upper rock down to the lower rock just prior to taking off. Late in the day, about the time when she would ordinarily take off to hunt, a cell phone person crept out onto the rocks, getting way to close to her. 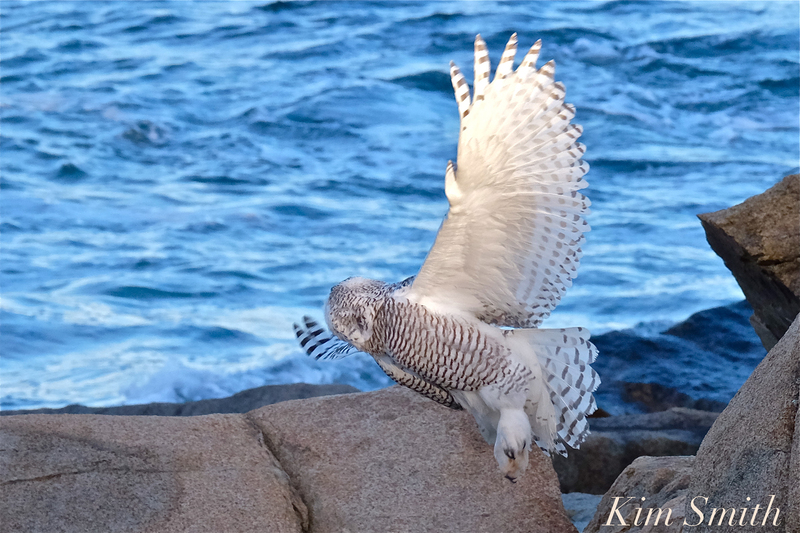 Hedwig was visibly uncomfortable and took off over the water. Suddenly and seeming from out of nowhere, Bubo came flying towards her. An aerial skirmish ensued but with no real contact. The battle appeared to be about establishing territory. 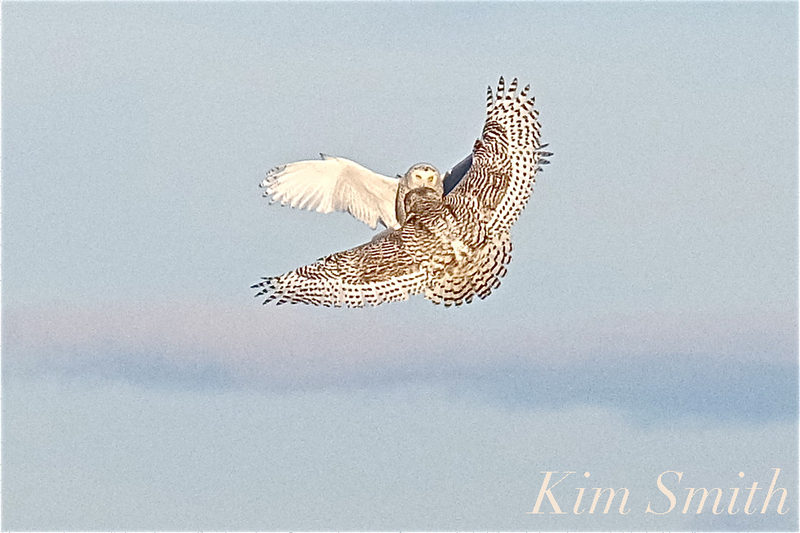 Although taking place out over the water in the distance nevertheless, you can see the owl’s facial expressions were incredible; click on the photos to see larger images. 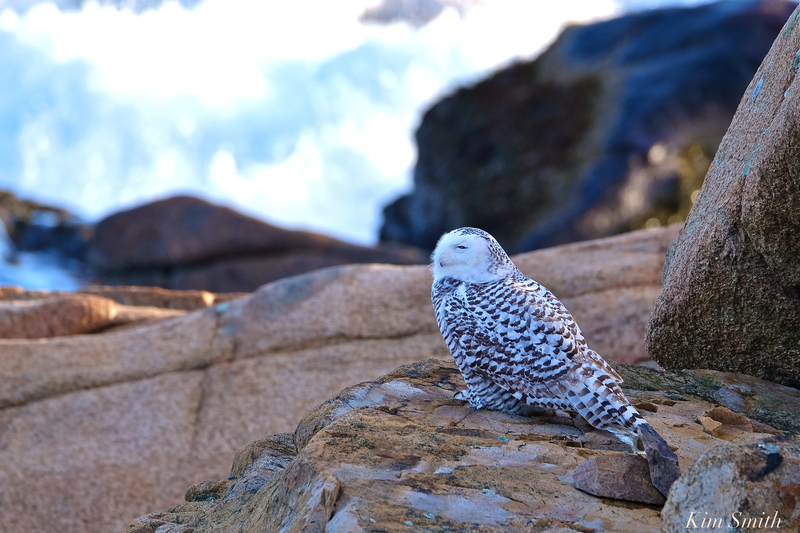 Bubo took over the rocky area near to where had been Hedwig’s perch for the day, while she flew further down the rocks. She perched on the the rocky beach, when the same cell phone person again got way too close, and caused her to flush a second time. Perhaps this was just an average day in a Snowy Owl’s life but I was reminded once again that nearly every moment of a wild creature’s life is a struggle to survive. 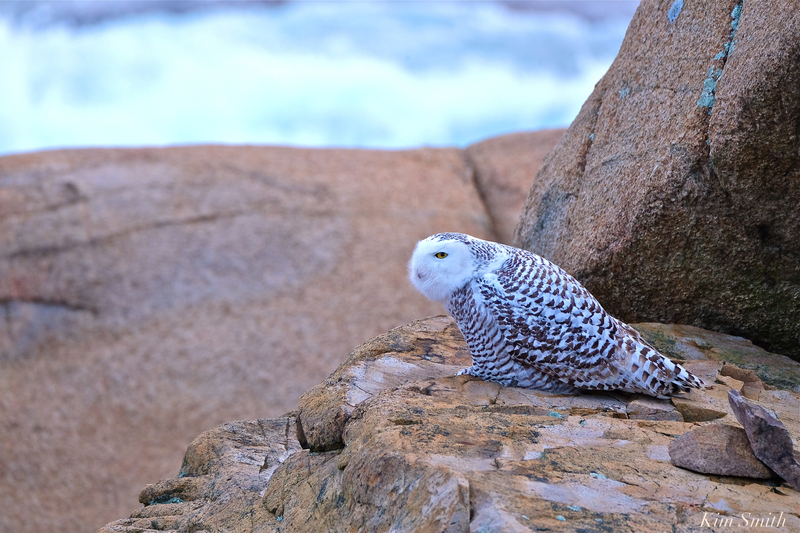 SNOWY OWL WATCHING TIPS: The following are some helpful tips for watching Snowy Owls. Watch from a comfortable distance–comfortable for the bird that is. Nothing makes the Owls more stressed than people getting too close. Please keep children from throwing rocks towards the Snowy or anywhere within the vicinity of the Owl. Please don’t allow dogs to play near the Snowies. There have been reports of Snowies flying into cars. They often fly low when flushed and it is easy to understand why this may happen, especially as the Snowies are drawing so much traffic. 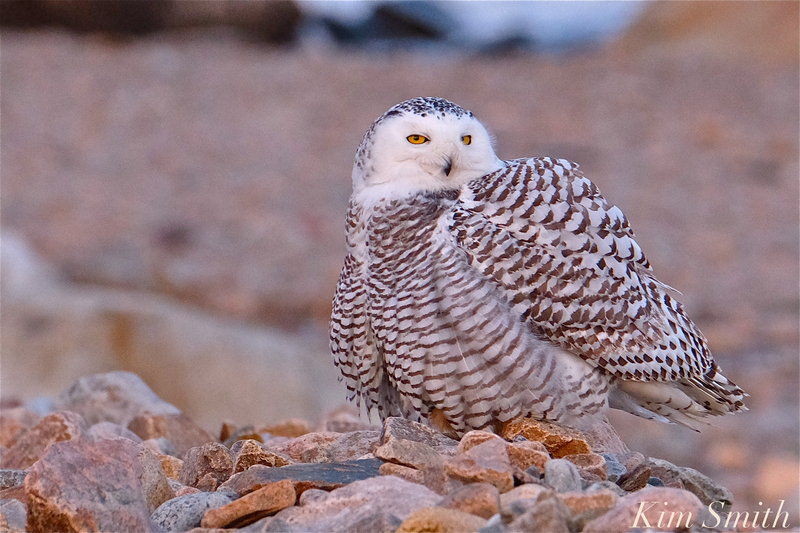 Please be on the look out when you are in known Snowy Owl territory. Slamming doors, radios blasting, barking dogs, and loud mufflers all stress the Snowies. 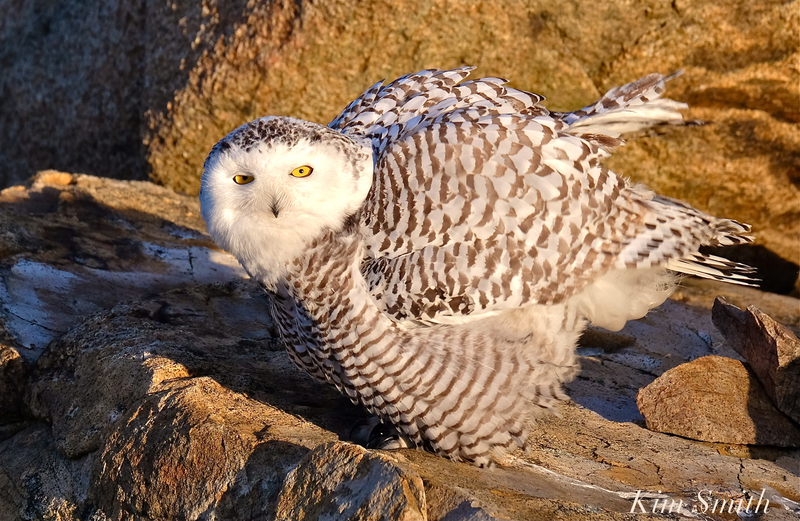 This entry was posted in Birds, Birds of New England, Eastern Point, Gloucester, Life at the Edge of the Sea, Snowy Owls and tagged Atlantic Road, Beautiful Birds of Cape Ann, Bubo, Bubo scandiacus, crows, female Snowy Owl, hedwig, male Snowy Owl, snowy owl fight, Snowy Owl Gloucester MA, tips for watching/photographing Snowy Owls on January 25, 2018 by Kim Smith.